This week I’m sharing ideas for ways to have your best Advent ever and not drive your family crazy in the process. Let go of the idea that you need to be in control of Christmas … We feel like we are making Christmas for our families but that is not true. We’re not making Christmas—Jesus makes Christmas. 1. Know that it won’t be perfect. Remind yourself right now that your goal is to grow in holiness during this Advent season— not have the perfect tree, host the perfect party, or buy the perfect gifts. Bring this spiritual goal to prayer and ask for the grace you need to do it. 2. Add something spiritual to your daily routine. Advent is a mini-Lent, but too often we don’t look at it that way. Is there some sacrifice you might consider giving up? Some prayer you might add to your routine, in the morning or at night? Look for ways to add something spiritual to the things you and your family do every day. 3. Add something fun to your daily routine. There is so much to do and so much to stress about, make sure you take the time to enjoy something simple, by yourself or with your family. You might take a drive and look at Christmas lights, attend a concert, or a play, or spend an evening playing board games. Find something simple and fun that will be memorable and meaningful. Maybe add some music to your days (here is the Advent playlist I mentioned on Spotify). 4. Plan a gift for Jesus. Look for a way to prepare your heart for Jesus in a special way during this Advent season. Is there a charitable project you might consider? Or a surprise act of kindness for someone? Are you holding onto resentment and need to forgive someone in your life—or ask for forgiveness? You might need to go to confession. Plan a gift for Jesus by preparing your heart for his coming. It’s an illusion anyway. Let go of the idea that you need to make Christmas special for your family. December 25 is going to come and go, whether you ever bake those cookies or not. Stay focused on the fact that the one who makes Christmas special is Jesus—not you. Leave a little space, in your calendar and in your heart, for God to control your Christmas. I also share feedback from listener Natalia, who is a single woman asking for advice on how best to prepare for a life with a husband and children. 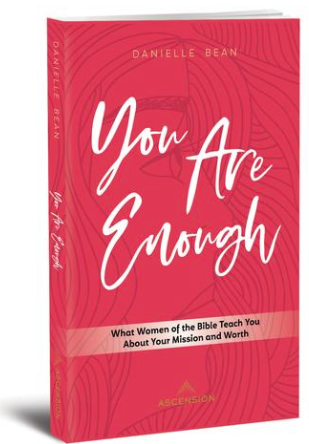 My new book, You Are Enough: What Women of the Bible Teach You About Your Mission and Worth, is currently sold out! You can find it on Amazon for now, but check back in to see when it’s available from Ascension because you can get a discount by using the code, GIRLFRIENDS, for ten percent off your order. My retreat, based off the themes in You Are Enough, has launched! Get all the information here!